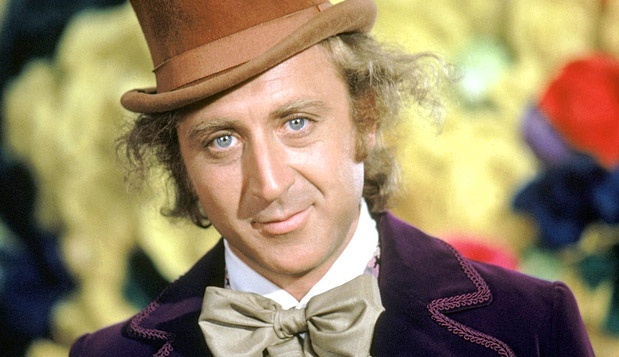 Willy Wonka — actually Gene Wilder in the better of the two Chocolate Factory movies — sang, “There is no life I know to compare with pure imagination.” But is it possible to have too much imagination? That thought occurred to me just the other day when I found myself with my head very close to a pail of moist seed starting mix – inhaling. I’m not sure what came over me. One minute, I was mixing the dry powdery combo with water – and the next, I was breathing. Deeply. Completely absorbed by the clean, fresh, earthy smell. I admit, when I’m working outside and I’m by myself, I do get lost in my own thoughts and imaginings – and it’s more than daydreaming of what to plant and where to plant it. No, that would be too easy. My imagination, I feel, needs a diagnosis. Like when I’m carrying my galvanized steel pail. I hear the slight squeak of the handle, and I imagine myself on a farm going about my daily chores. Or in the morning, just before the sun breaks the horizon, and I’m outside listening to the chorus of birds greeting the day. I feel as if I am in a very rural place, far from a crowded neighborhood and asphalt. And then there was the time I weeded the courtyard area, the one with the Nikko Blue Hydrangeas surrounding a cement pillar with a vase on top. For whatever reason, I chose a cd of chants by Hildegard von Bingen as my soundtrack for the job – and that’s when it happened. The wind chimes hanging in the branches of the White Birch became the bells of the cathedral, and I was now a medieval friar tending to my garden in a corner of the abbey’s grounds. Maybe I should be the star of my own educational Saturday morning cartoon. Little Kevin steps outside as a real boy but when his imagination starts, so too does the animation. Suddenly Kevin is an explorer charting newly discovered territories or a botanist identifying plants or a friar tending his medieval garden — all from the comfort of his yard. So far, I’ve managed to keep the line between imagination and reality from blurring — that could be a problem. And if that weren’t enough, there is the battle against those who would like to rob us of our imaginations and keep us grounded in the gray world of real life. If it were up to them, there would never be a Candy Man! I think imagination keeps us young and alive and creative. To paraphrase the response to Virginia’s Santa Claus letter: Alas! How dreary would be the world if there was no imagination. There would be no childlike faith then, no poetry, no romance to make tolerable this existence. We should have no enjoyment. . .
We should also have no postcards embedded with seeds. I’m sure this idea has been around for some time, but it’s a new concept to me – and I have to credit the imagination behind the idea. My friend Cathey mailed me the postcard along with a note to plant it. 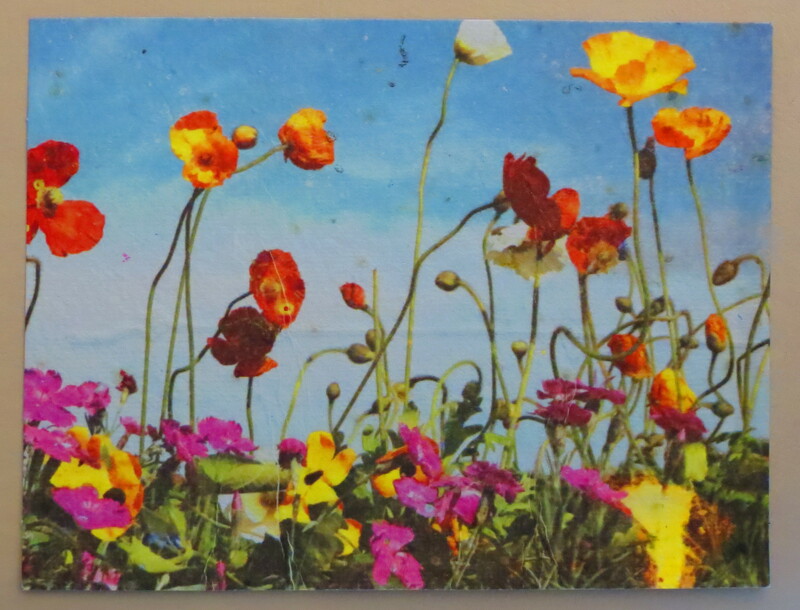 When I read the small print on the back of the postcard, I learned that this was part of a fundraising effort and that wildflower seeds were embedded into the postcard. Just plant the card and add water. A little Internet research later, I not only discovered some companies (Botanical PaperWorks, Flower Seed Paper, and Bloomin) that create these plantable postcards, invitations, gift tags, and stationery, but also directions on how to make your own seed-embedded paper. And that is my diagnosis, as well as the diagnosis of many of the gardeners, readers, and bloggers I have met in recent months. Kevin, your words are seeds themselves, blooming in the fertility of cyberspace. You have enriched our lives with your imaginative musings, powerful insights, beautiful thoughts, profound reflections. Without your blog, we have but rock piles, never knowing the fragrant cathedrals you imagine. I hadn’t seen those types of cards, but how fun!!! I think all gardeners have imagination. How else could we look at things the way they are and only see the beauty of our vision? It’s a great idea — a card and a gift all in one! Keep imagining! Oh Kevin – what fun! To become truly lost in one’s imagination while tending to one’s gardens is more than delightful. Thanks to you, come spring I will allow my introductory-thoughts to soar. Rather than wonder if my ancestors enjoyed their yards as I do mine, I will become one of my ancestors and tend to their flowery dreams. Beautiful sentiments. Enjoy your past and your present. There’s no stopping our imaginations. That’s why it’s so fun to plant giant gunnera or a tiny groundcover, we can create new worlds with our gardens! I love your post! Oh, Kevin, if you do start making paper, you’ll love it! It’s utterly seductive. And you can use lint from the drier, if your clothes are mostly natural fibers. Reading your blog lifts my spirits, and teaches me about writing and connecting. I’m thinking of giving it a try — perhaps this summer. And thank you for your encouragement and kind words. Beautiful words Kevin! My sentiments exactly, but I can’t say it in words as well as you can. I love my dreams and imagination that is one good reason to keep gardening, to get lost in your thoughts. 1. Daydream of a low cost pond boy who’s sole mission is fishing leaves out of my pond and looking good doing it. 2. Daydream of my neighbor telling me his yard is wasted and I should use it to expand my growth of tomatoes. 3. Daydream of the garbage coldframe I just purchased taking flight in this wind and landing on the shiny car of the person that sold it to me. 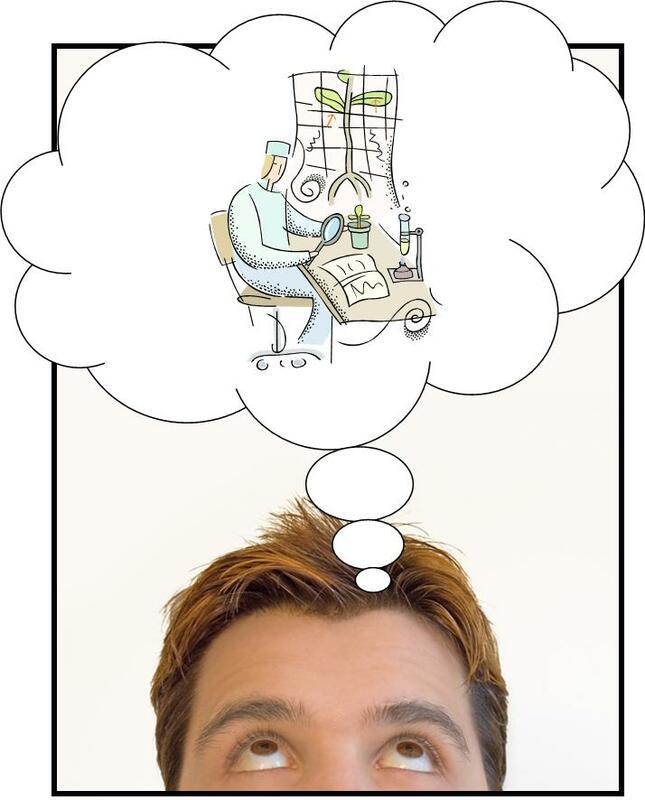 🙂 I enjoyed reading your daydreams — and I must admit, I have had similar dreams (and they still bring a sense of serenity). Thanks for commenting. I agree! I think one’s imagination keeps them young and alive too. My garden is a magical place for me. I loved reading your post. It was quite enchanting. Many thanks. Through gardening, we each create our own private retreat — a world we imagine and make for ourselves. On a practical note, I’d like to know how to create such cards. I send many messages through snail mail still and this card as plant is intriguing. I am clearly not an expert. Just click the link for “directions” and you will be taken to a how-to site. Good luck! I do the EXACT same thing. I’m glad to know I’m not crazy! That would be very nice. I will contact you with my information.